This week, I head to Capitol Hill to advocate for America’s military and contract working dogs – our canine war heroes. I’ll be joined by Specialist Brent Grommet, Corporal Jeff DeYoung, and their battle buddies, with our celebrity champion, Naomi Judd. As we prepare to advocate for changes affecting military and contract working dogs, I am reminded of the healing power of the bond for battle buddies on both ends of the leash. Brent’s mother wrote me the most touching letter (below). Through a mother’s words, we can learn about the power of the human-animal bond. I promised Debbie that her words would be heard, and that we will do all we can to advocate for our new legislation, Matty’s Wish, ensuring that ALL our military hero dogs come home and are reunited with those with whom they have the closest bond. My son, Brent Grommet, left for Afghanistan in November 2013. 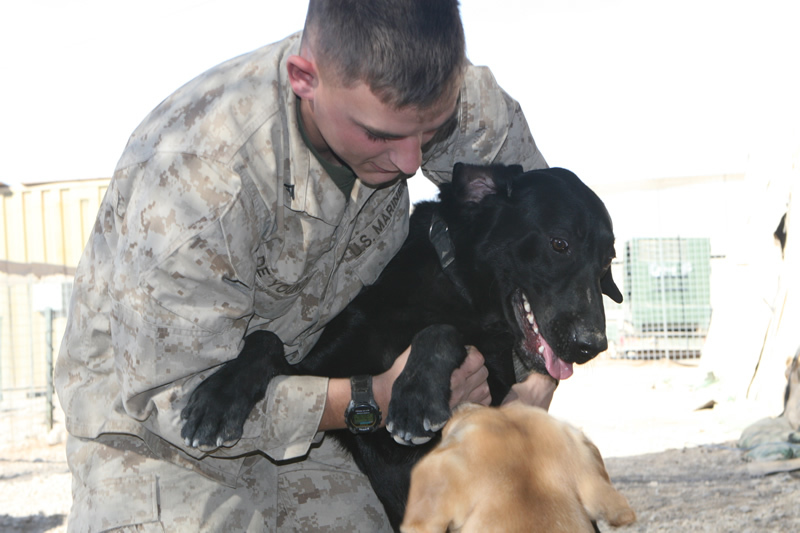 He had a partner, a 4-legged Battle Buddy named Matty. As you know, my son’s partner, battle buddy, the one that trained with him, shared his bed, protected him and made Brent stop breathing when he had to send Matty into a culvert to check for IEDs, was wrongfully given to someone else. My son’s world collapsed. He stopped talking to friends and family, he lost his smile and his heart was shattered. There was little conversation. My husband searched for 13 months trying to find someone to listen, someone to help. My husband found you and the American Humane Association. Robin, you listened, you helped, and Matty was returned to Brent on 11-14-2014, at 11:30 p.m. The next day when we sat with you at Cracker Barrel for breakfast, you were the first stranger Brent spoke to since his return from Afghanistan. I sat next to my son that day, he was talking to you, and I saw something I hadn’t seen in a long, long time. I saw my son returning. Matty has helped my son in a way only soldiers know how to do. I can’t explain it, only to say this: Together they trained, together they protected each other, and together they went to hell and back. One of them was staying awake while the other slept. They watched each other’s backs, alerting each other to immediate life-threatening danger. As soldiers, they did what soldiers do: they fought battles, cleared roads, lost 17 friends and were injured together. They won’t speak of their deployment, only to each other. But late at night, when Brent finds himself back in war it takes a nudge from a wet nose to say I’m here, it’s okay. And when Matty’s legs twitch and he whimpers, and then the whimpers turn into growls and snaps, it takes a soft word from Brent – Matty, it’s okay. Then Matty snuggles closer to touch Brent and both drift back to sleep. When they arrived home from Afghanistan, Brent remembered every painful detail. Due to standard military procedure they were to be given 10 minutes to say goodbye. At that point in time, Matty didn’t know what was going on. Brent did however, he felt as though a huge part of him had been ripped apart. Matty was placed in an all-metal cage. As soon as the door closed, Brent heard something he had never heard before, Matty was screaming, frantically trying to dig his way out of the metal cage. Then Matty started to bite at the door. Brent continued to hear the screams for another 30 seconds as the truck drove away. My son has told me he has only cried three times in his military career. This was one of the times. On a separate occasion, Brent was doing laundry, when the door to his bedroom closed behind him, Matty was in the bedroom. In the time it takes to load a washer, start it, Matty had crushed the door knob with his teeth and splintered the door frame. Again, it was to find Brent and be by his side. These two together do more for each other than any doctor, therapist, counselor could ever do in a life time. In four months Brent met with you in Palm Beach, Florida. I never thought Brent would travel again. This bond was born in the United States Army, welded in war, sealed in the blood of Afghanistan. This bond will never be broken. Being separated for 15 months didn’t damage it. These two soldiers NEED to be together. Please tell Washington that our Military men and women NEED their partners/dogs. This is what “Matty’s Wish” is about. If they don’t listen, try again, keep trying until someone, like yourself, hears you. It might take months, years, but in the end you will save lives, as you did with Brent and Matty. Soldiers need soldiers to help heal. Thank you for saving my son SPC Brent Grommet and my grandson SGT Matty, U.S. Army.